THIS DRESS SOLD. EMAIL DRESS INQUIRIES TO SALES@BRIDESFORACAUSE.COM This informal wedding dress is hand-crafted in crystal beaded embroidery on luxe taffeta and features a wide v-neckline with straps as well as gorgeous beaded trim that adds the perfect amount of sparkle and detail to this gown. The pleated bodice creates a slim waistline while the flared and pleated floor length skirt adds a fun yet elegant style. The back of this gown is complete with a zipper back closure with covered buttons. 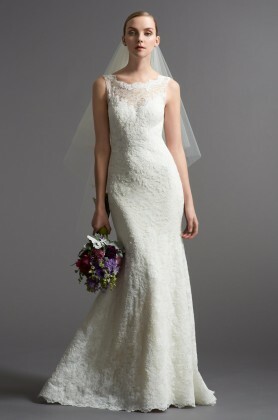 Choose beaded wedding gowns to add sparkle and glamour to your gown today! This dress was donated from a store. Sample gown. We have one dress in size 10!